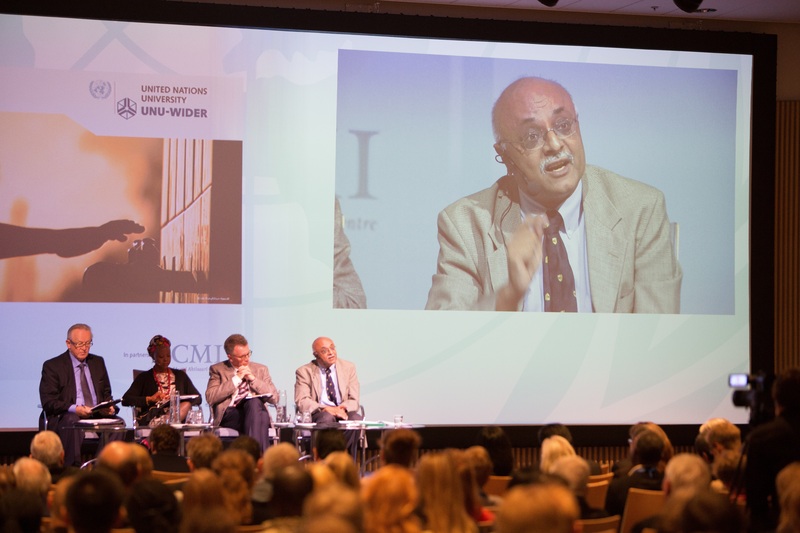 Professor Ravi Kanbur has been appointed as Chair of the WIDER Board. He succeeds Professor Ernest Aryeetey, Vice-Chancellor of the University of Ghana, who served as Chair during 2009-2015. Professor Ravi Kanbur (rigtht) particpated in the panel discussion following WIDER Annual Lecture 17 in 2013. From left to right: President Martti Ahtisaari, WIDER Annual lecturer 2013; Elsle Kanza, Head of Africa at the World Economic Forum; Martin Ravallion, Georgetown University; and Ravi Kanbur, Cornell University. Ravi Kanbur is the T.H. Lee Professor of World Affairs, International Professor of Applied Economics and Management, and Professor of Economics at Cornell University. His main research interests include development economics, public economics and economic theory, and he has over 250 publications, covering a wide range of topics in Development Economics, particularly in the area of inequality and poverty. Professor Kanbur has published in leading economics journals including the American Economic Review, Journal of Political Economy, Review of Economic Studies, Journal of Economic Theory, and Economic Journal. His latest book is on Development Ideas. Professor Kanbur has a particular interest in bridging the worlds of rigorous analysis and practical policy-making. For an interview with Professor Kanbur on assessing inclusive growth, see below.